Medhu Vada is a traditional favorite of South India that features not just in everyday cuisine but is also an indispensable part of the menu on festivals and puja days. It is one of the most cherished delicacies of India. Without addition of onions it is offered to gods. In the name of Vada Mala. It is a protein rich fritter. Slightly crunchy on outside and soft on inside. These medhu vadas are often served with Idli, Dosa and Pongal in restaurants. The vada tastes good when paired with Chutney and Sambar. But I love to have the vadas with coconut chutney or urad dhal thogayal. You can prepare this vadas simply without adding rice flour in the batter. But it goes too soft. I have tried in both the ways. I felt the taste and texture was good with the batter with which I had added flour.You can soak a tablespoon of rice with the urad dhal and grind also to arrive to this recipe. Soak urad dal for 2 hours. Use whole urad dal without skin for better results. 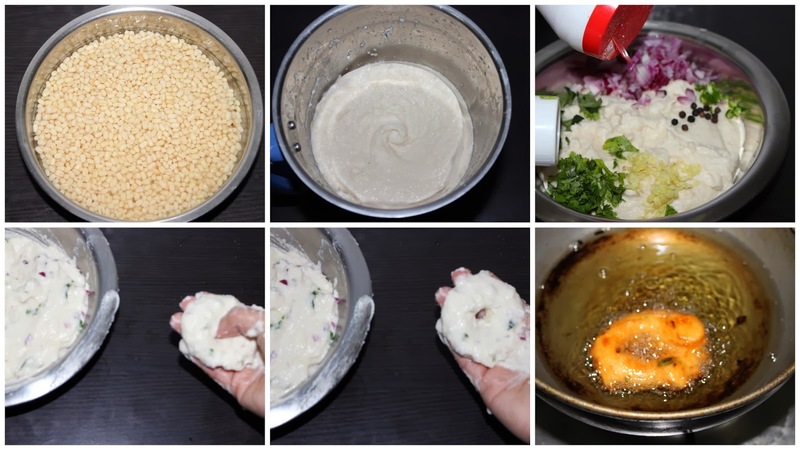 Grind urad dal with only little water ( ¼ cup) till you get a fluffy white stiff batter. Now add the corn flour, chopped onions, ginger, green chillies, curry leaves and add all these to the batter along with salt and asafetida. Mix well, keep aside and heat enough oil in a deep pan. Now wet your right hand well by dipping inside water and take a small ball of batter. And use your thumb to make hole in the middle and drop it in oil, just invert the vada over the oil and slightly shake your fingers. 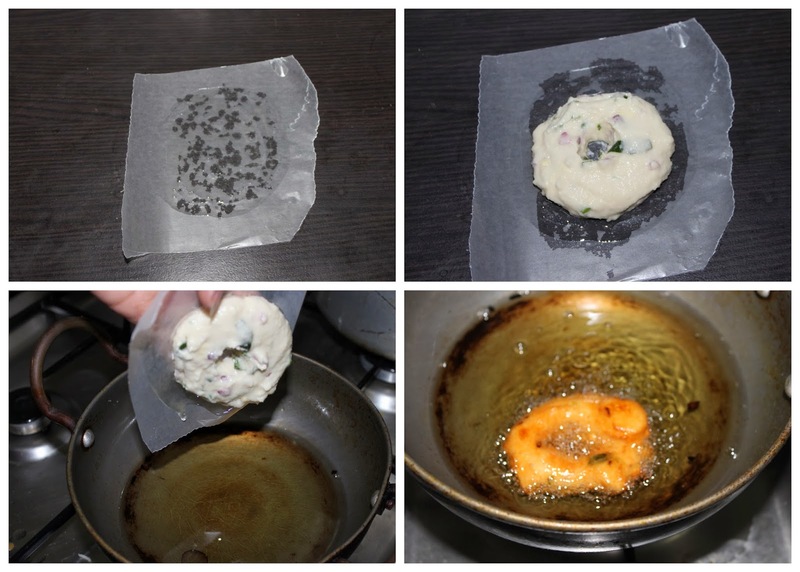 Now carefully invert the paper and drop the vada in oil and lift the paper back. Fry in medium flame, turn the vadas and fry till both the sides turn crisp and golden brown. Note: If you want this recipe in the way that prepared in restaurants (Puffy and crunchy). Add a pinch of baking soda in this batter. If your vadai drinks too much oil or u are not able to shape the vadas then it means you have added more water, reduce next time. For time being add rice flour or semolina or gram flour or Maida/all purpose flour to reduce vadai drinking oil and to make in proper shape. 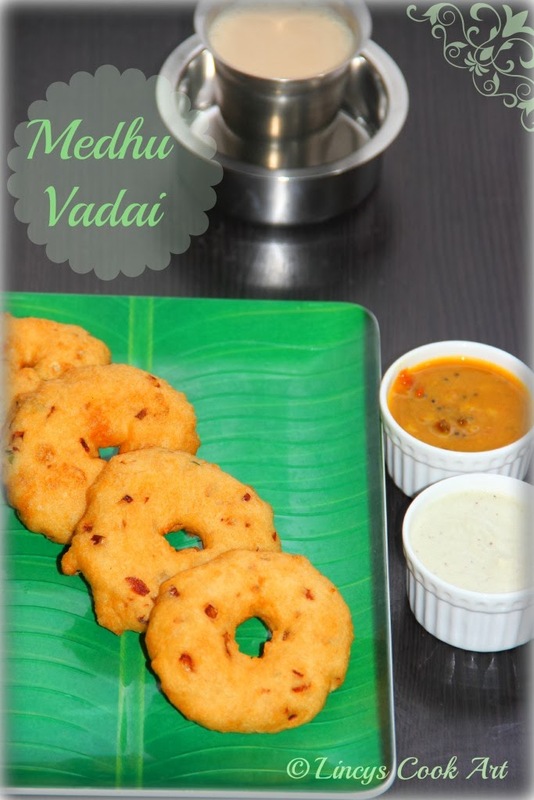 very very delicious medu vada :) they look fantastic and so tempting !! delicious crispy uzhunnu vada. My fav. Medhu vadas look awesome and mouth watering..all time fav. I have nominate your blog for Liebster Award. Please collect it from my page. Yummy crispy vadas. Love it. Made to perfection and I am loving it, my fav savory snack. Perfectly made medhu vada. A wonderful tea-time snack. Delicious crispy vada Eliza.. Perfect. Perfect shape! Looks crisp and delicious!